Caley Thistle manager John Robertson is taking inspiration from the winning mentality instilled in Europe’s triumphant Ryder Cup team. Robertson was a keen observer as Thomas Bjorn’s side claimed a 17 1/2 – 10 1/2 victory over America in France last weekend, with footage since emerging of a motivational video shown to the European team on the eve of the tournament featuring messages from past captains Brian Huggett, Sam Torrance and Jose Maria Olazabal. Inverness remain unbeaten seven matches into their Championship campaign, and trail leaders Ayr United by three points ahead of tomorrow’s home match against Morton. Although Caley Jags have earned plaudits for going a total of 18 league matches without defeat in a run which stretches back to March, however Robertson feels the Highlanders should have taken more points and has urged his players not to rest on their laurels. Robertson said: “It is only seven games. People are going on about last season, but last season is last season. “It is all about what we’ve done and what we’re doing this season. We’re disappointed to have drawn four matches from seven. “We’d like to have won more than that. That’s what we’re looking at now. We want to try to even the score up and make it four wins and four draws and then move on again. “It is all about winning matches. I looked at a Ryder Cup quote this week, when the players were sent a video from the ex-captains. 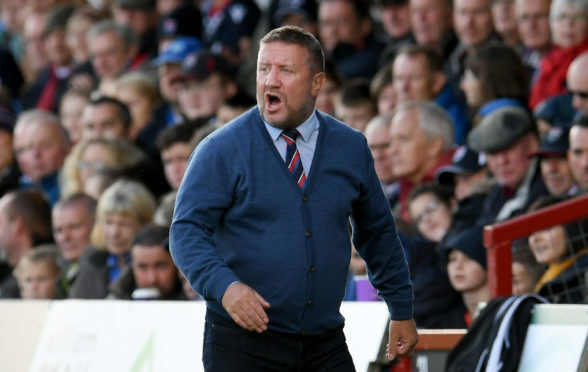 Despite Robertson’s demands of a winning psyche, the Caley Jags boss is refusing to read too far into his side’s league position, adding: “When you’re up at the top of the table at this stage in the season it is a bonus. I keep repeating, it is just about picking up points. “We move on again on Saturday and try to get three points.